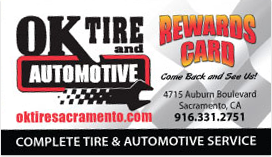 When it comes to auto repair Sacramento has numerous mechanics and automotive shops for you to choose from. With such variety, choosing the right car repair facility for you and your vehicle can be difficult! If there's one thing you should know about OK Tire & Automotive, it's that we are truly here to serve YOU and provide you with the absolute best auto repair experience in Sacramento and the surrounding Fair Oaks, Citrus Heights and Carmichael communities. Why Choose OK Tire & Automotive? Free Vehicle Safety Inspections - We perform a complementary, comprehensive 32-point vehicle inspection with any auto service because the safety and longevity of your vehicle is our job and our passion. Our Personal Auto Repair Guarantee - All repairs are guaranteed for 24 months or 24,000 miles. 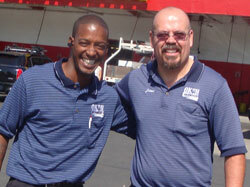 That's parts and labor, in-store and on the road, at more than 14,000 automotive repair shops nationwide! Free Pickup and Delivery - We will pick up and return your vehicle from your home or work - we've got two full-time drivers counting on you to keep them busy! Family Owned and Operated - We live where you live. We support local causes and the wonderful people within our community. No Surprises - No work is ever started without your complete understanding of the repairs to be done and your approval of the costs. Free Oil Change Program - When you sign up for OK Tire & Automotive's FREE Customer Loyalty Program you'll get every 5th oil change service for FREE! Free Lifetime Tire Care - When you buy new tires from us, you get flat repairs, tire rotations and tire re-balancing FREE for the life of your tires. In-Store Financing - Instantly available upon credit approval - no annual fees - qualifying purchases are eligible for 6-months no interest! If there are ever any additional services we can provide or ways we can help make your auto repair Sacramento experience with us better, please do not hesitate to let us know! We know that having your car, truck, SUV, minivan or hybrid in the shop isn't something that you look forward to, but at OK Tire & Automotive, we want to make it as convenient and enjoyable as possible. Making you happy is what makes us happy!